United States President Donald Trump is a divisive figure to say the least, but an Indian man has gone a step further by actually worshipping the former reality TV star, according to The Hindustan Times. 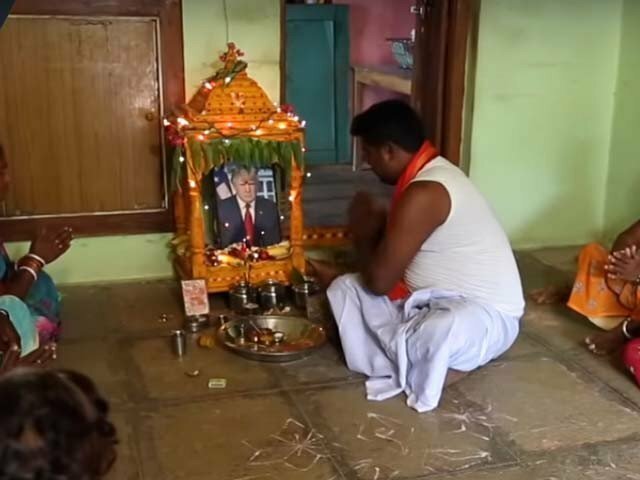 Bussa Krishna, 31, who is farmer from the remote Konne village in Telangana’s Jangaon district has setup a photograph of Trump in his puja room and worships it every day along with other Hindu gods. Bussa offers vermillion, turmeric, flowers and at the end of his prayer does “aarti” to the photograph. The idea struck him after Srinivas Kuchibhotla, a software engineer from the state, was killed by a US navy veteran in an alleged act of hate crime in February last year. “I was very much pained at the incident. I thought the only way the US president and his people could understand the greatness of Indians is to display our love and affection towards them. That is why I started worshipping Trump with a hope that the prayers would reach him one day,” he said.